In our neck of the woods, Spring has sprung! The weather is warmer and we love to romp in the yard when we can. The only problem us pups have is it seems the sky just likes dumping water everyday WOOF! Rainy days are the worst cause we are all cooped up in the house except our “gotta go” times. But, then, call me what you like but I hate gettin’ my feet wet and muddy! Them siblin’s of mine don’t seem to care though. They go splishin’ and splashin’ right on through the water and mud! The look on my Lady’s face when we get back to the door says it all WOOF! Yup! One look down at them monster paws of my brothers and sisters all soaked and covered in mud even makes me cringe and curl my toes! 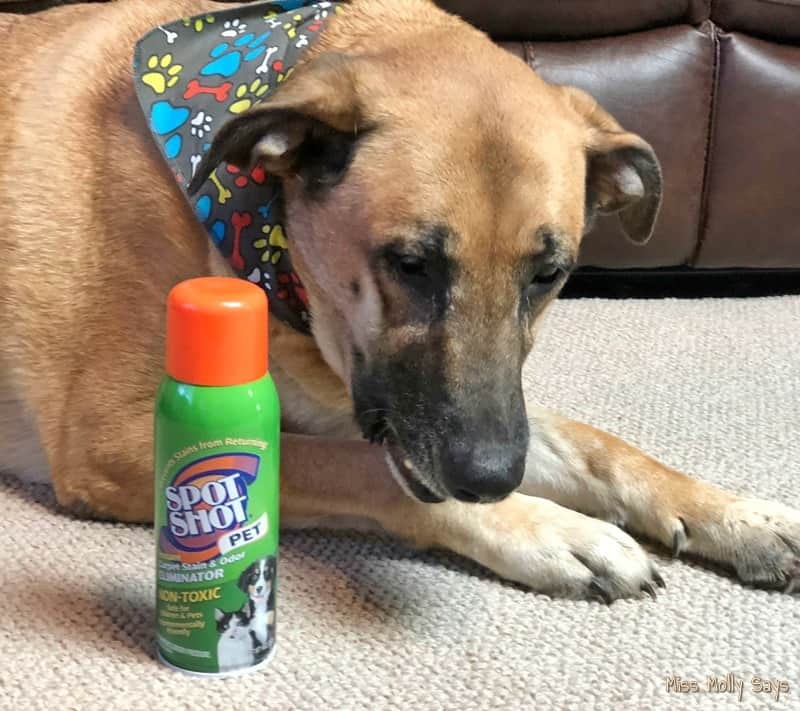 But, my Lady has patience and she also has some cleaning tips for pet owners that, of course, includes her trusty Spot Shot® Pet Instant Carpet Stain & Odor Eliminator that will help get you through the rainy season. I’ll be glad when the rainy season stops and we can have fun in the sun and I’m purdy sure my Lady is wishin’ for that day too. After all, with 8 of us here (that adds up to 32 paws – WOOFERS!) trackin’ up the place who can blame her WOOF! Lemme fetch my Lady to tell ya her tips for keepin’ our home clean amidst all the rain and mud. When it comes to pups and messes, it seems we roll right from one season’s messes to the next. Winters melting snow and mud is never fun, but Spring certainly brings its own challenges. At least during the Winter, the ground is frozen most of the time. With Spring and its torrential downfalls, we have a muddy mess the biggest part of the time. It is enough to make you groan when it is dog walkie time! With a pack of 8 dogs here, cleaning is something I know VERY well! Honestly! I think (make that KNOW) they own the place and I am just the maid! 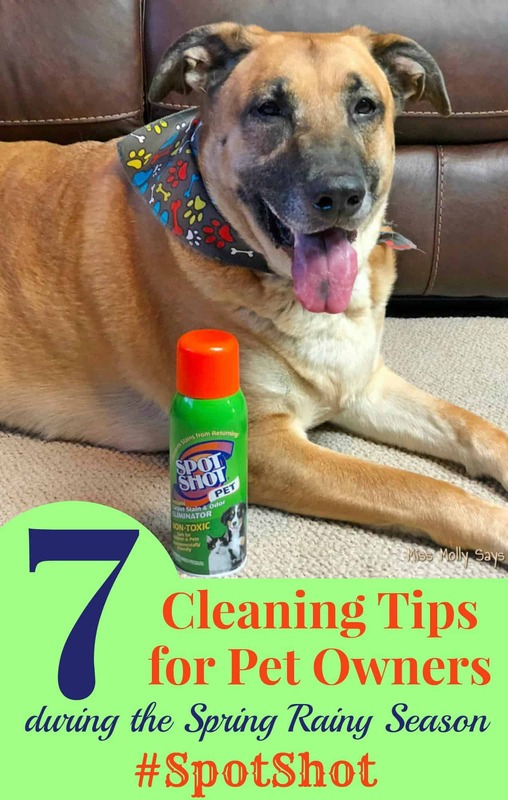 However, I have learned a few cleaning tips for pet owners that will help make keeping your home clean and stain free easy even during the rainy, muddy seasons. Let’s take a look! Beyond the ordinary vacuuming and cleaning, the Spring rains and mud create other problems in the home. We love the rain because it washes the awful pollen from the air, but it also creates havoc for pet owners! Between mud getting tracked in, mud turning to dust that settles on everything, it also can become ground in stains! Here are a few cleaning tips to help you survive the wet muddy season! Once our dogs are in the house and have been wiped down, their wet hair can transfer residual dirt onto their blankets and bedding. Once the bedding drys, the dirt becomes airborne and settles as dust in your home adding to your dusting chores! So, be sure and launder beds and blankets as needed. 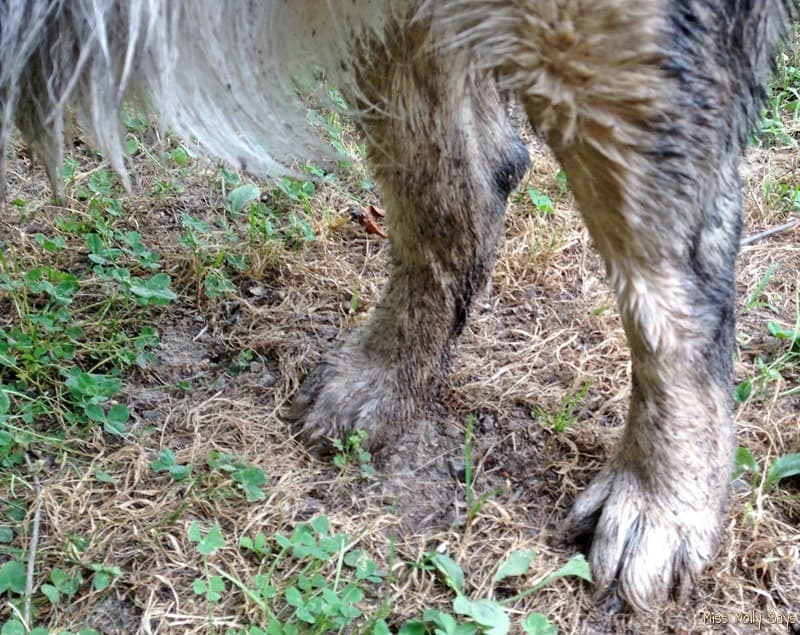 Whether you realize it or not, your dog’s collar collects mud and dirt along with oils from their skin. It can turn into a nasty, greasy, and stinking mess. So, even though you thoroughly groom your dog, a dirty collar can add the stink and dirt right back to them! You can wash their collar by applying dog shampoo then gently rub, rinse, and allow to air dry. Better yet, throw it into an old pillowcase and tie it off. Then, simply toss into the washing machine and allow to air dry – easy peasy! If you have ever dealt with a wet dog then you know an ultimate shake is coming, right? Whether it be one good shake or several smaller shakes, they can sling water across a room without batting an eye! During the Spring rains and muddy season, this can result in mud splatters across your walls, furniture, and appliances. Use a damp cloth to quickly clean up any splatters as soon as you find them to keep your home looking fresh and clean. 4. Wet Dog and Muddy Paws! As I have said before, our number one defense is keeping a towel at the door. Dogs learn very quickly to wait and be toweled down before entering the home. I keep both a dry towel and a wet one. The dry one works for drying them down when it is raining. Remember to dry the belly where mud and water cling to the hair! The wet towel works for removing mud from their feet and from in between their toes. If your dog will allow it, you may wish to try a small bucket of water or a paw plunger. Keep it by the door and give your dog’s paws a quick swish and then towel dry. This is a fabulous way to clean your dog’s paws of mud. 6. Door Mats are a Must! I can’t stress enough how important double doormats are in controlling muddy paw prints! Place one on the outside of the door and one on the inside of your home. This gives them much more area to cover and dry their feet before they step on your good carpet! I’m sorry I got mud on the carpet Mom, but your magic Spot Shot will save me won’t it? Accidents happen! It has happened to me! While I am trying to clean one dog up, another one darts past and into the house with mud-caked feet and continues to run circles on my nice clean carpet. YIKES! No need to panic though! I rely on my trusty Spot Shot Pet to help me quickly clean up the mud stains. With Spot Shot Pet Carpet Stain & Odor Eliminator you can power out tough pet stains! 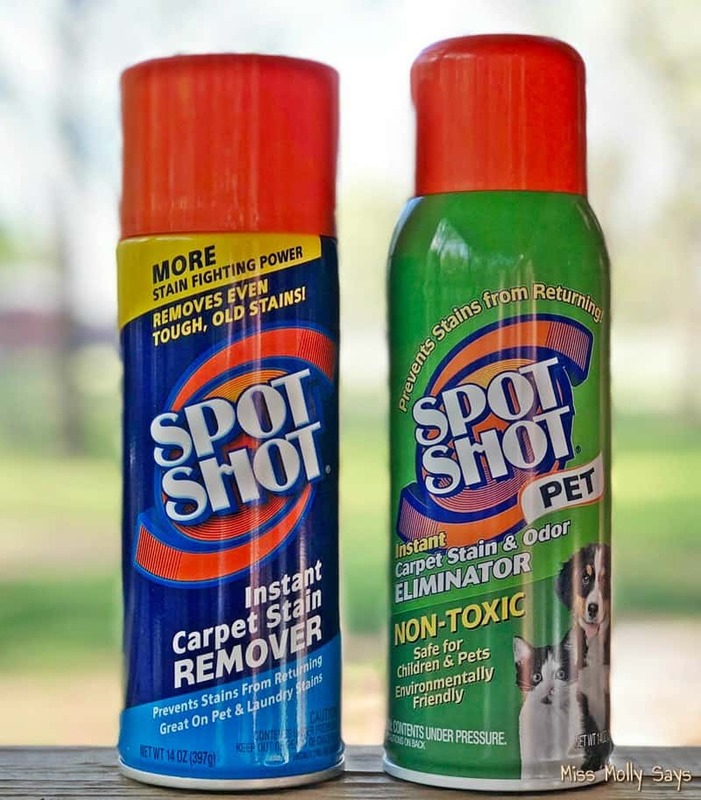 What is Spot Shot Pet Carpet Stain & Odor Eliminator? 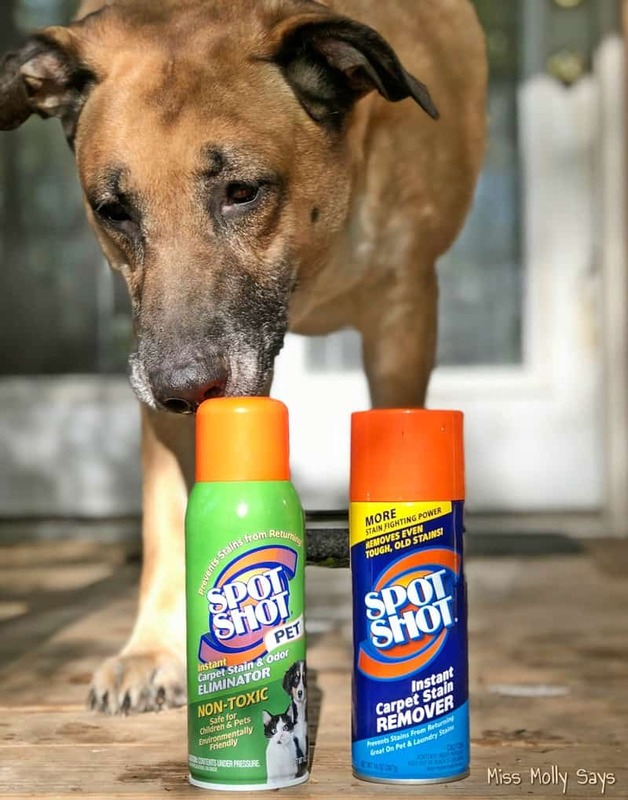 Spot Shot Pet is a non-toxic aerosol that powers out tough pet stains and permanently removes even old stains and odors and prevents them from returning. It tackles tough tracked in mud, vomit, urine, and feces! It’s dual-odor eliminators absorb and neutralize odors. Plus, its Anti-Resoiling agents protect carpet and keep stains from returning. 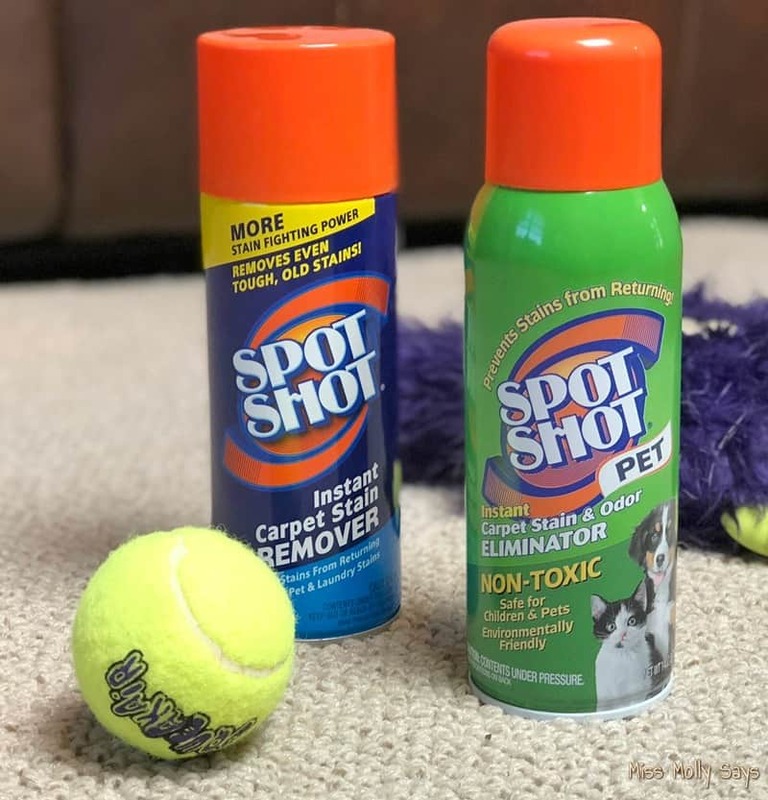 Spot Shot Pet is easy to use and there is NO SCRUBBING REQUIRED! You simply spray the stain, allow the product to sit a few minutes, and then blot up the residue with a clean dry cloth. Old stains may require a repeat application. 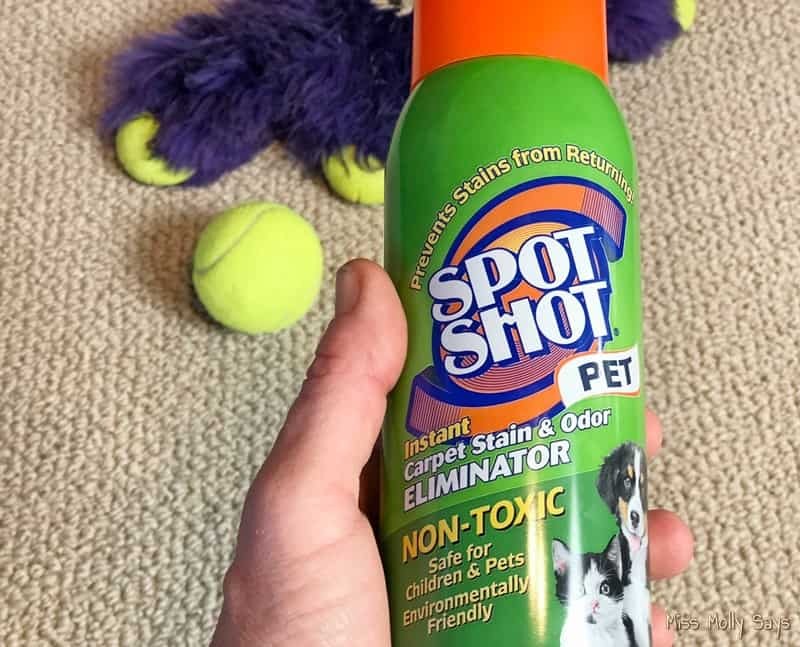 You will also be happy to know that Spot Shot Pet is NON-TOXIC and SAFE FOR PETS, KIDS, and the ENVIRONMENT when used as directed! Put these tips into play to keep your home clean and stain free through the rainy months! And remember, the next time you are out shopping, be sure to stock up on Spot Shot Pet! After all, no one wants dirty ground in paw prints on their carpet! You can find Spot Shot Pet Instant Carpet Stain & Odor Eliminator at your local Walmart and other stores. For a store near you, check their handy “where to buy tool“. Before you head out shopping, grab a money-saving coupon to get $1 off Spot Shot! And, if you would love to learn more stain fighting tips, be sure and join the Stain Fighting Community on Facebook! Lots of cleaning to do in this wet and muddy spring season. What a good idea to wash their collars and to have a door mat. I use spot shot and it does work. My three Coonhounds run back and forth across the yard, so when it rains, they leave a path in the grass and turn it to mud! I’m constantly having to clean up after them when they come in. We’ve replaced some of our carpet with wood flooring, which makes it easier to clean, but we still do have carpet and I haven’t tried this product. I’ll have to get some! Im a gardener and my dogs are always in and out with me all day long. Its so hard to keep up with their dirt. Need the cleaner. Definitely going to check this out as I do have carpet in my house. I love their products. It cleans pet messes up quick! Great tips! I really hadn’t thought about washing my pet’s collar until now. I’ve heard so many great things about SpotShot from other pet owners. Thanks for sharing! We’ve used Spot Shop. It’s a great product! Spot Shot sounds like something we need. I will be trying it out. I’ve never heard of this but it looks like it would work great. Thank you for the great tips will come in handy this spring specially now that we live within feet of an park. Mud coming in and out of the apartmnet all the time. I will definitely have to look into this product! I love Spot Shot, it has worked for me on every stain I have ever used it on. I need a case of this stuff with all the messes my pets make! Love that it’s environmentally friendly and pet safe. I’m getting some on my next trip to the store. These are awesome tips! I have four furbabies and a backyard that tends to get get really muddy! I am a big fan of Spot Shot. This works really well. I’ve been looking forward to spring to get my mud room cleaned out. It’s so hard with the dogs and the winter is just impossible to clean! I have use Spot Shot and it truly does work on stubborn dirt stains and grass stains. 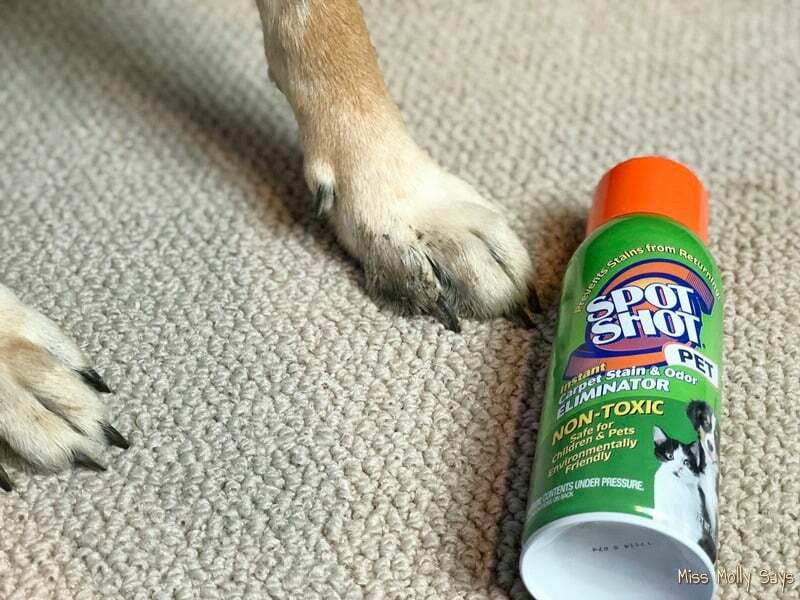 That was always my nightmare is when the dogs go out right after my husband mows the grass…green paws..lol But Spot Shot removes the stain no problem! Glad to see this review, i have been thinking about getting this. Thanks! I thought I had a lot of work cleaning up after 2 cats and a dog but you are really a champion pet owner and cleaner. Peaches is always making messes! Great article and tips on products! Glad such a product exists . It’s very handy. These are great ideas! I especially love the idea of the towels at the door for the wet and muddy paws! Thank you for such valuable information! Love the tips, thank you so much. I need to give the pet version. We have a chihuahua and even though she is house trained and knows to use the pads we leave inside she still has ‘accidents’. I have not seen the Spot Shot product before. We are in the midst of taking out all the carpet in our home. Thankfully we wont need to spot treat carpet any longer. I could have used this product a few times before the removal of the carpet. Excellent point about washing the collar. It is a must as the collar sometimes smells worse than the dog. I’ve used Spot Shot, good stuff! Great tips too, and I really liked the pillowcase trick for washing collars!! I have used Spot Shot, I have been happy with the results. I try to wipe the mud off my dog before he comes into the house. This sounds great my dog tracks in so much mud I can’t seem to keep up with him. We use Spot Shot a lot. It’s one of the few Spot removers that work. It’s easy to use! We’ve used it on our car seat too. This and one other stain remover are the only ones we use. Thanks for the coupon! WOOF!! we have cat’s and thay don’t go out but still need the stain remover for all the mess that Cat’s can do. These are great tips. I learned a long time ago if you are going to have dogs you are going to be doing a lot of cleaning. I love all the nice tips and pointers on cleaning after my pup. I have two bulldogs, and one is a puppy so this is a product I need to try! Thanks for sharing.